The Hot Dog Truck: Name That Hot Dog! I am revamping my menu for the spring (no more crayon scribbled on torn cardboard) and I want to "name" my hot dogs. I figure a menu with catchy names for the hot dogs would be cool. For instance mustard, relish and onion is called "All Around," a plain hot dog is a "naked puppy," etc. OK people, Name that hot dog! Thats "The Blonde". 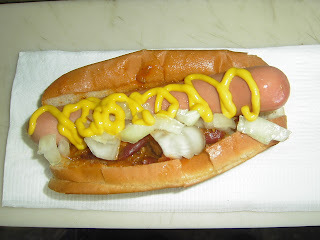 Naked (no grill marks), Yellow Mustard (Blonde Hair) and Onions (Hot!) Chili (Makes it wet) Just like a Blonde! Oh you two...Get a room! Oh and the Dog, how about the mutts nutts! 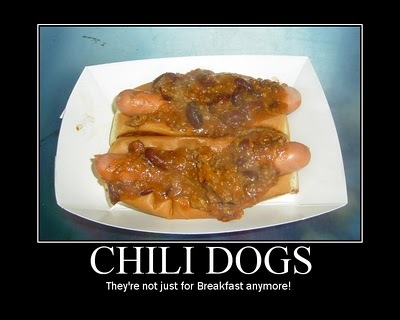 Well since a chili dog with mustard and onion is probably the worlds most perfect hotdog, I say give it a simple name. Like good old #1.